It get's off to a very shakey start...the opening three cuts do absolutely nothing for me...but by the end of it's long sixteen track run, this third outing from the fictional animated band masterminded by ex-Blur frontman Damon Albarn emerges as the most enjoyable Gorillaz outing yet. 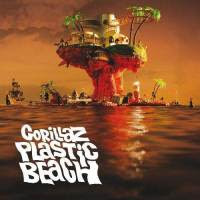 Conceptually, the approach on Plastic Beach is basically the same, hip-hop mashes into Brit-pop mashes into reggae mashes into straight soul mashes into other global influences, often all in the same song in a variety of surprising ways. What's changed here is that unlike on the first two releases, which despite all the genre change ups were very even-keeled affairs, Gorillaz now seems much more interested in exploring extremes: Aggressive numbers like the electro-romp Glitter Freeze and the ready-to-combust, reggae-based Sweepstakes are really aggressive; Lazy numbers like the Lou Reed-led Some Kind Of Nature couldn't sound more lazy; Melancholy ballads like Broken and Up On Melancholy Hill are really, well, melancholy, and exercises in abstract beauty like the hard to categorize album peak Empire Ants couldn't be more beautiful. It all adds up to the most dynamic album Albarn and fictional friends have yet to release, a slow starter that picks up steam relentlessly the deeper you dive into it. Though not quite a Strong Recommend from me, I still see this making a lot of year-end top 20 lists, and any anyone who naturally gravitates towards this type of playful, world-oriented hip hop is strongly encouraged to pick this one up. Cherry Pickers Best Bets: Empire Ants , Glitter Freeze , On Melancholy Hill , Sweepstakes , Plastic Beach .